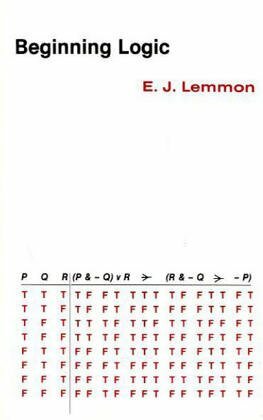 Edward John Lemmon was a logician whose main area of expertise was modal logic. His book ‘Beginning Logic‘ is likely one of the better ones out there for those just getting into logic in order to understand the different rules in modal logic. Lemmon begins with an introduction on logic and why it is necessary to talk about the subject. After giving a very well laid out overview of why logic is required he begins by talking about the rules of logic and why each one is necessary. Although the book on it’s own is likely difficult to understand, it is a good reference book to see why certain rules are the way they are. (By rules I refer to the rules of derivation from one set of formulae to another). Not only does he give a detailed explanation of each rule he also goes into the concepts of completion and why each set of rules are complete in their respective areas. He covers 2 separate areas of logic: propositional and predicate. Propositional logic is logic that only uses ‘operators’ such as \(\rightarrow , \land , \lor , —\). (Here he uses \(—\) instead of the now traditional \(\neg\)). Propositional logic is also sometimes referred to as sentential logic or propositional calculus. In predicate logic Lemmon adds the symbol \(\exists (x)\) for ‘there exists an x’, and \((x)\) for ‘for all x’. This format is not necessarily traditional, but Lemmon is working before standards were fully developed. His syntax can be slightly difficult to follow, but after working on it, it is not the worst syntax out there. Who this book is for: This book should be used in conjunction with some other books and is good for someone who is looking for an english language description of logic and the different rules associated with proving results.